DocVerify's approved and certified e-notary solution for commissioned notaries is a hosted offering, and the government trusted e-notary provider leader since 2007. Requiring no software to download or hardware to buy, as all the notary needs is access to the internet and a browser - that allows notaries to transform their notary business in a matter of minutes. If you're a commissioned notary and want to notarize documents online, earn up to five times or more as much as traditional paper and pen notarizations, it’s easier than you think to use an e-signature / e-notary platform for notaries, and start to notarize electronically. Just sign up with DocVerify, enter your notary credentials, and you'll obtain an official electronic notary seal to notarize online once approved. Now that you know how to become an electronic notary or remote notary, click here to learn how to get started with the most trusted electronic and remote notary solution in the world. If you're a business or organization you can use DocVerify to manage your existing notaries, and enable them to either perform electronic notarizations or remote notarizations for the company. With DocVerify, you can easily manage each notary, and also have access to documents they notarize giving your company the control it needs while making the notary process more efficient. Start saving time and money with DocVerify e-notary platform. Additionally, with DocVerify's powerful set of API's, widgets, and webhooks you can also automate many of the notarization processes into your existing applications. Looking for an Online Notary or Electronic Notary? If you're looking for a notary to either have your documents e-notarized within your state through a commissioned DocVerify notary or to have your documents notarized remotely with a DocVerify notary, please contact the notaries directly by using the notary locator tool or the remote notarization request form as DocVerify does not perform e-notarizations directly as notaries have their own notary businesses. Although electronic notarizations have been legally available in many states for more than a decade, in 2012 the state of Virginia expanded electronic notarizations to allow their notaries to also legally perform remote based notarizations through a secure web cam session. This next big step has allowed notaries to be able to electronically notarize documents from virtually anywhere at any time. To date, the states of Montana and Ohio have a form of online notary or remote notary laws, and in 2018 the states of Texas and Nevada will also allow remote based notarizations similar to the Virginia model. This solution streamlines workflow by securely storing electronic notary journal entries and signers in a contact list, eliminating the need for multiple entries. The journal is securely stored online and accessible from anywhere, so you never lose track of your journals or signers. The electronic journal entries are automatically created for you as part of the electronic notary system or you can also use it as a replacement for your paper based notary journal. Unlike traditional paper based notarizations or paper based notary journals where it can leave you open and vulnerable to certain types liabilities that can easily manifest themselves into lawsuits against you, the DocVerify platform can help protect you by reducing your exposure to these liabilities because of our tamper evident, tamper proofing, and time stamping technologies. It will provide you with the proof you need when you need it most. Don't be a victim of frivolous lawsuits. DocVerify's platform can be used to perform E-Notarizations in states that allow electronic notaries that are legally binding in all states, such as: Arizona, Arkansas, California, Colorado, Delaware, Florida, Idaho, Indiana, Iowa, Kansas , Kentucky, Louisiana, Maryland, Michigan, Minnesota, Montana, Nebraska, Nevada, Ohio, Oregon, New Jersey, New Mexico, New York, North Carolina, Pennsylvania, Rhode Island, Texas, Utah, Virginia, Washington, West Virginia, and Wisconsin. Some states such as Virginia, Montana, Texas, and Nevada will even allow their commissioned notaries to remotely notarize documents from a web cam. 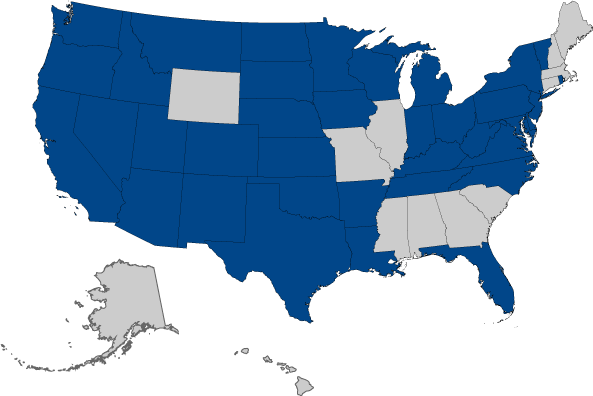 The map below shows states that either have electronic or remote notary laws or states that are also considering e-notary laws. What are remote or web cam notarizations? Getting started as an E-Notary with DocVerify couldn't be easier. Upload a document or a notary request, enter basic journal information, and specify the participants that need to sign. With a single click place the elements, the participants can review and sign, and the notary can sign as well. The document is made available to all parties and securely stored. Your Clients Will Be Impressed! DocVerify is a member of the Notary Trust Registry , and your e-Notarized documents are also automatically registered with the Notary Trust Registry for you ensuring trust. What States Allow Electronic Notary?